Located in the Buckingham neighborhood of Richardson, TX is Camden Buckingham – a community of luxury one and two bedroom apartment homes. These apartments in Richardson, TX feature 9-foot ceilings with crown molding, chef-inspired kitchens with modern cabinets and decorative tile backsplash, granite-style countertops, stainless steel appliances, washers and dryers and large walk-in closets in every apartment. 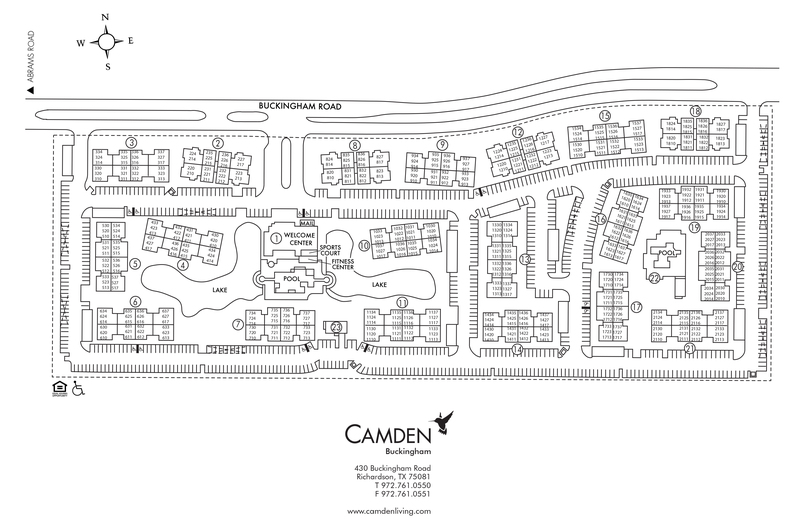 Living at Camden Buckingham apartments means you do not have to look far from your home for something to do. Relax by one of our two spectacular, resort-style pools and enjoy an evening with friends at our poolside grills. No matter the weather, never miss a quick pick up game using the indoor sports court interchangeable for basketball, volleyball, soccer or badminton. Looking to get work done or get a workout in? You'll find cardio equipment, free weights and endurance training equipment available at all times inside our 24-hour fitness center and complimentary WiFi and a multi-functioning printer inside the e-Lounge. The leasing office is at the center of the action - inside you'll find your friendly Camden Buckingham leasing team, complimentary WiFi, comfortable seating, and free gourmet coffee 24/7. Your furry friends will love it here too! Our pet-friendly community features a serene, catch and release lake surrounded by scenic walking paths, and your apartment home will be just minutes away from Bush Central Barkway. In our Richardson apartments, you will have an easy commute anywhere in the Metroplex. Your apartment is less than 5 minutes from Highways 75 and 635 and 3 miles from the DART-Arapaho Center Station. Our community is idealy located less than 2 miles from Richland Community College, 5 miles from UTD and just 7 miles from the great shopping and dining at NorthPark Center Mall. Living here means spending less time commuting and more time enjoying all the amenities offered at and around our community. Life is more exciting at Camden Buckingham! At Camden, your pets are family too! We welcome cats and dogs, up to two pets per apartment home, with a full-grown maximum weight limit of fifty pounds each. We'll save a spot for you! Each resident receives one parking space. All other parking is first-come, first-served. Visitor parking is available along the back row of the community. Garages are available for you! Detached garages are available for $65 to $90 per month and carports are available for $25 to $35 per month. We also offer bike storage for $5 per month.